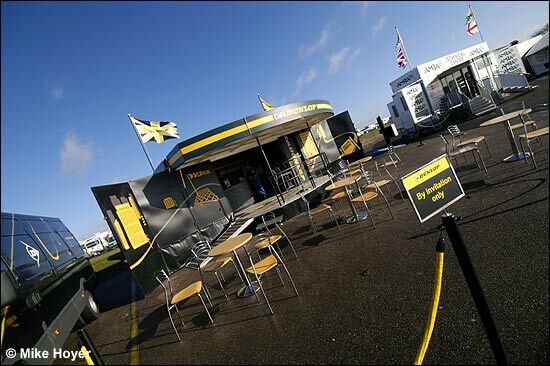 The first Dunlop “Great and British Festival” was held at Snetterton on Sunday April 2, and saw big grids and action packed racing for Dunlop’s brand new race package – writes Mike Hoyer. The day started off with bright sunshine for the first Radical Biduro race (although the first race had actually taken place late on Saturday afternoon - a win for Dominic Lesniewski, in the Matador Radical event, above), although this soon gave way to generally overcast and cloudy skies. Nevertheless, the rain that had been forecast managed to hold off for most of the day, before a sudden shower halted the second Radical Enduro race. 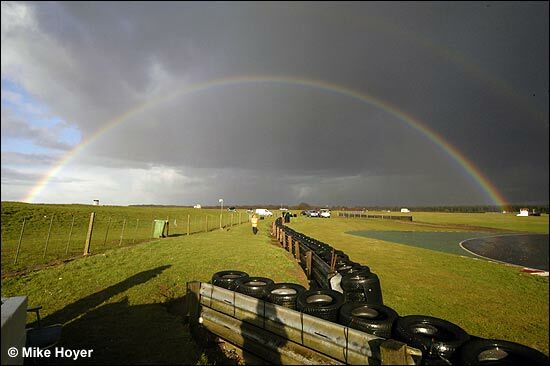 The subsequent soaking track gave the young Ginetta junior drivers a hard time of it in the final race of the day. As well as the Radicals and Ginetta Juniors, there were races for three different Mini series (MINI Challenge for the new shape cars, and Miglia and Se7ens for traditional Minis), and two different historic touring car championships, the York Fitness Post Historic Touring Car Championship, and the Ibis Packaging Solutions Classic Group 1 Touring Car Championship. Spectators at the event also had the chance to get up close and personal to the cars in the lunch break; the Radical Enduros were out on display in the pit lane, and the Biduros were lined up on the grid, with the drivers available to chat to. 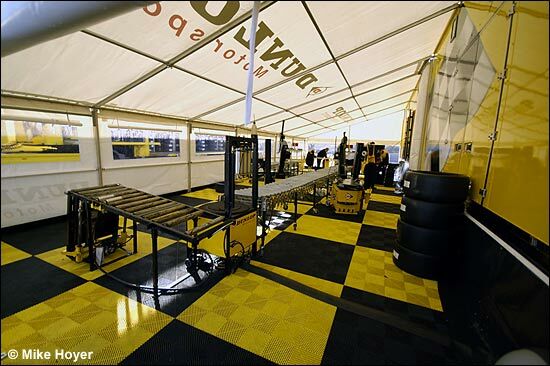 This was part of a move by Dunlop in order to bring the spectators closer to the racing, and to bring potential newcomers into the sport. 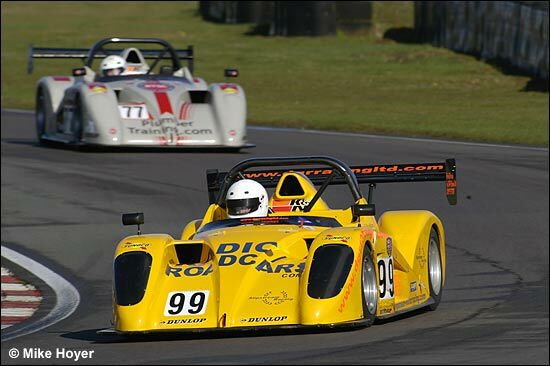 The days racing started at 9.10am with the first of two 20 minute races for the Radical Biduro championship, contested solely by the 1200cc Kawasaki-engined Radical SR4s. The race was dominated by Slipsteam / Radical Road.com driver Guy Hodgkin, in #99, who led every lap after starting from second on the grid. Pole-sitter James Saggers finished fifth, after dropping back at the start. 16 year old Toby Newton was seventh – having only gone solo for the first time on Friday, and having raced on slicks, when most were on wets. Saggers (in #5, above) made amends in the second race, with Hodgkin in second, although he pushed the RPM Motorsport man the whole way, with several attempts to pass into Riches corner. Newton took his first podium, having already listed Mick Hyde as one of his scalps. He's about to make his move (in fourth, below). 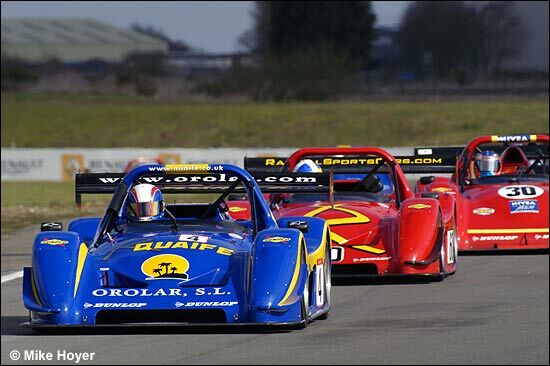 ... the Radical Enduro cars set off on the first of two 40 minute races. For 2006, the championship is being contested by SR3s, with 1500cc Powertec Suzuki engines, and SR8s, fitted with 2600cc V8 engines. It will feature two 100km races at each of the nine “Great and British Festival” weekends, featuring pit stops, and driver changes for those cars with more than one driver. 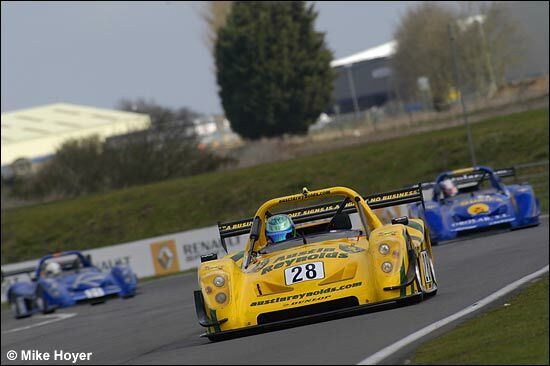 Pole position in race 1 was occupied by Ince / Kinsella, with Austin Reynolds and Nick Padmore, in their SR8 (above) alongside, with Chris Milner and Eugene O’Brien third quickest. 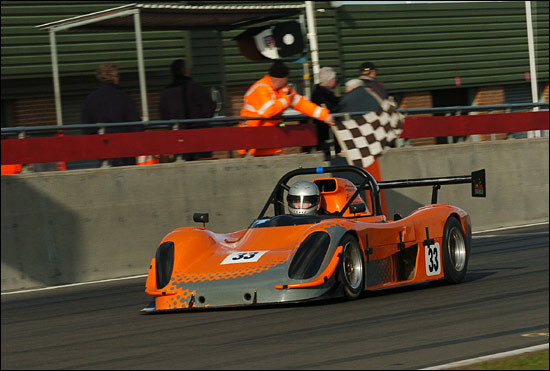 Reynolds and Padmore led the majority of the race, but it was Lee Atkins and Phil Quaife in the #4 SR8 who came through to take the win on the last lap. The second race saw a similar grid, with the front three the same (but in a different order). 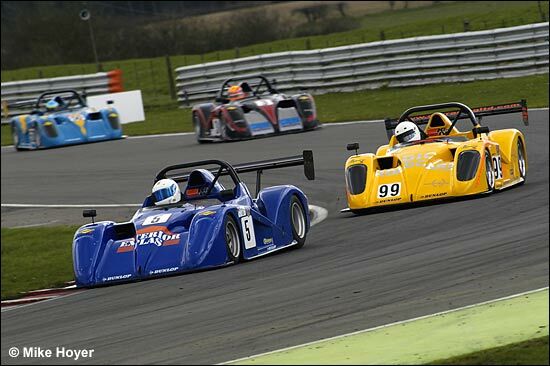 Third spot was occupied by Richard Ince and Austin Kinsella (#3), who barely featured in the first race (losing two laps with a collapsed rear wing), but came through to take the win in the rain shortened encounter (down to 35 minutes). Radical’s Phil Abbott, with Nick Dove, was second, and Milner / O’Brian were third. 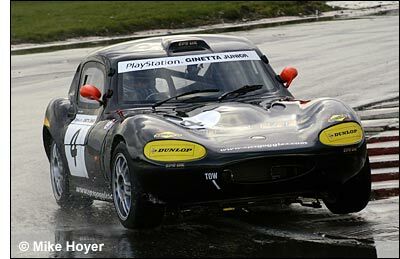 Next up, the Playstation2 Ginetta Juniors took to the track, for a 20 minute encounter. 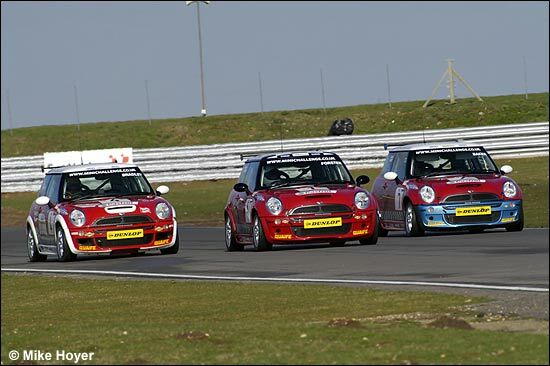 These small cars are powered by 1400cc Ford Fiesta Zetec engines, and are open to drivers aged 14-16, looking to then progress to the senior version, and onwards into sportscars. 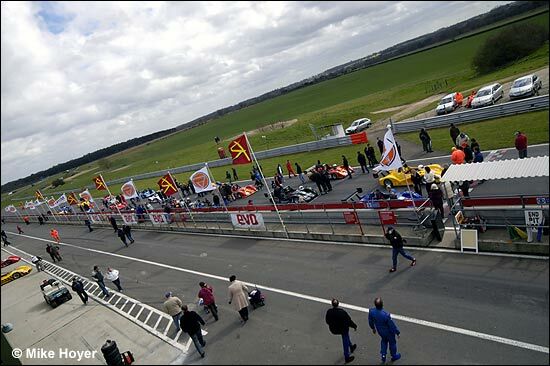 A famous name occupied the pole position spot, in the shape of Henry Surtees, son of former world champion, John. Also taking part in the race, albeit further down the order was Fergus Walkinshaw, son of TWR man Tom Walkinshaw. Surtees lost out at the start, and was down to third at the end of lap one, but led every lap after that to take the win (below) by nearly six seconds. Walkinshaw finished 11th, and one lap down. The second race took place at the end of the day, and track conditions had changed for the worse. ntermittent, but heavy, showers meant that the track was soaking by the time the cars were released, and as a result of this they were given two green flag laps. Pole man Surtees led them round at a snail’s pace, and almost stopped on the grid after the first lap, only to be waved around again by the marshals! When the race got underway it was a fairly disjointed affair, with wildly varying lap times, as the young drivers struggled round the soaked track. Most seemed to suffer some sort of off-track excursion, or bodywork “modification”, but in the end it was Robert Gaffney who took the win, completing 11 laps in the 20 minute race. Surtees was second, with Tom Sharp third. The York Fitness Post Historic Touring Car Championship in association with Dunlop saw a variety of interesting machinery competing, including Chevys, Jaguars, Fords, and Mazdas. 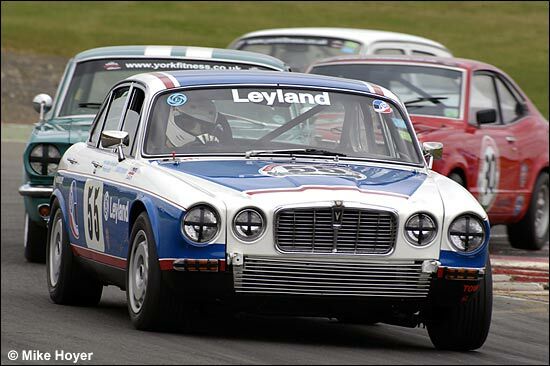 David Howard dominated the race in his Jaguar XJ12. 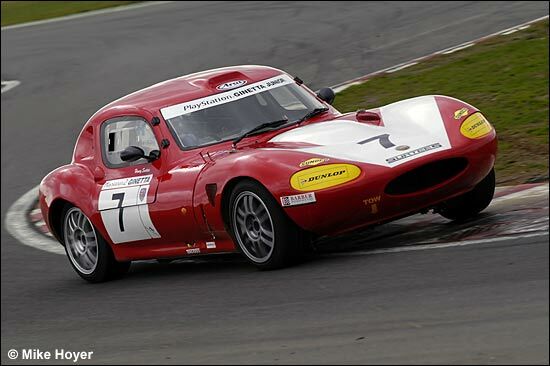 Howard was out again in the IBIS Packaging Solutions Classic Group 1 Touring Car Championship, and had a long battle with the XJS V12 of Brian Stevens, who then spun off, allowing Howard to take a second win. 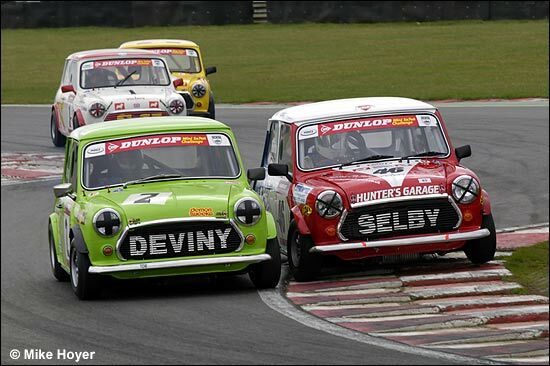 Special mention should also go to the action packed, kerb hopping, and panel bashing Mini Se7en race. Max Hunter took the win after shoving his way past Andrew Deviny on the last lap (below). Although it’s early days for the Dunlop “Great and British Motorsport Festivals”, it looks like it could be a big success in national racing. The large grids, varied machinery, action packed races, and accessibility for members of the public all combine to make a successful package. Dunlop also plans to increase the off-track attractions as the season goes on. 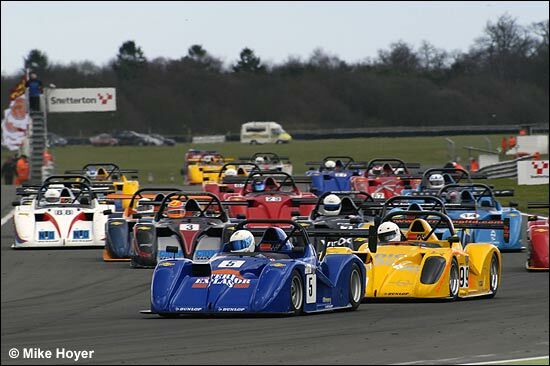 The next event is at Brands Hatch on April 29 / 30. Well done to Mike Hoyer, for keeping up with all the action. 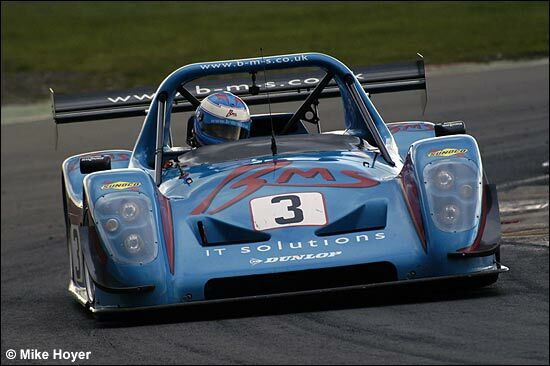 "A great success," says Radical's Mick Hyde - of the first event of the new Dunlop package. 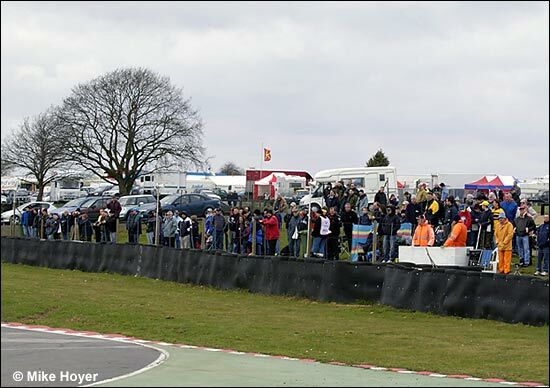 "Good grids, great racing, fantastic buzz in paddock, flags everywhere (blowing horizontal) and even a small crowd of spectators. TV coverage on Sky and Motors TV - and we even arranged for the camera car in the second Radical Biduro race to catch fire! Not funny for the driver though."